Browsing through the latest October 2016 issue of Policy & Politics, I was ‘inspired’ to review the article on understanding the implementation of targets in government. The analysis of public administration and public policy is often haunted by the tyranny of the contemporary. New theoretical lenses, innovative conceptual ideas, unfolding policy problems and crises, if not the anticipation of future problems, they always manage to attract a whole lot of attention. There is more traction to be gained from introducing a new theoretical approach than from refining and improving existing approaches. Researchers and students sometimes seem more motivated to understand tomorrow’s problems than to deal with the current. The predictable effect is that the theoretical landscape of public policy and administration is filled with abandoned half-baked start-ups: new and intriguing approaches that have been abandoned for newer and more intriguing approaches long before their potential could be realized and they had the chance to mature and develop to their full potential. Nevertheless, it is always inspiring and laudable to see scholars build on existing frameworks in order to expand their scope and use for understanding public policy, both theoretically as well as practically. In Christina Boswell and Eugenia Rodrigues’ analysis of the implementation of targets in different policy fields by the British government, Kingdon’s now classical multiple streams approach is used to assess whether and how targets in different fields are implemented and how this may change over time. In particular, they show how different organizational problem constructions on the one hand and differences in central political commitment to policies on the other, create different types of policy implementation, which may change over time. This has allowed them to add a temporal and organizational dimension to Kingdon’s framework, making it less static and more useful for the analysis of changes in policy implementation. Boswell and Rodrigues come to a typology of implementation styles, based on Kingdon’s distinction between the political and problems streams. They distinguish between consensual, coercive, bottom-up and, simply, non-implementation. For instance they describe how clear targets for defense procurement were virtual dead letters, simply because there was insufficient support in the political stream. The law in the books was very clear: there were rather specific targets and procedures to be met in order to prevent slippage. The law in action, however, featured many theoretically important actors in the policy field taking a soft stance on the implementation of these targets. The National Audit Office and the Treasury did “not feel sufficiently concerned or capable of intervening to ensure that targets were met”. The Ministry and other important policy actors were also not too enthused to enforce this issue which was only moderately important politically . As a result, the “targets were poorly implemented”. In some other areas, however, they find different – and changing – patterns of implementation. The analysis is inspiring, precisely because it touches on current policy issues and allows us to understand them. Just last week I was in a discussion on the merits of the new governance regime for Dutch higher education which, in part, uses targets and rewards as a mechanism to improve the quality of universities. We had a long discussion focusing on the system itself and what its effects were likely to be. My best guess was to say I didn’t know, simply because the targets as such would not necessarily produce any kind of result. It all depended on circumstances. But what circumstances? After reading Boswell and Rodrigues’ paper I could come up with a much better answer: if you want to know whether and how targets are implemented, it is wise to focus on the political commitment to those targets on various levels on the one hand, and to the organization’s ability to link those targets to experienced problems on the other. This approach allows us to understand why some targets may be mercilessly pursued while others remain dead letters. 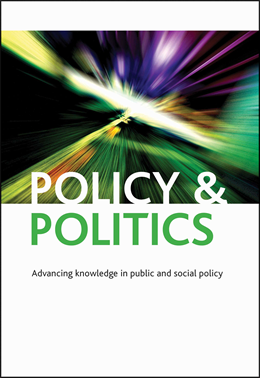 If you enjoyed this article you may also like to read Policies, politics and organisational problems: multiple streams and the implementation of targets in UK government by Christina Boswell and Eugenia Rodrigues.